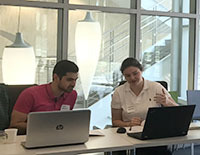 In response to graduate student need and with faculty support, the EAS Division Director of Communications, Trity Pourbahrami, and Christina Birch, STEM Writing Specialist in the Hixon Writing Center and Lecturer of Engineering, taught two pilot communication workshops for EAS graduate students in February and April of 2017. The workshops were designed to improve students’ abilities to showcase their field expertise and to deepen their understanding of communication tools and techniques. The students learned how to align the message of their research with specific audiences and their strategic communication goals. They had the opportunity to create strong visual aids to communicate their core scientific and engineering messages. In addition, they gave presentations and received peer feedback, incorporated this feedback into their presentations, and set new personal goals. The responses of students and faculty to the workshops were very positive, and a new EAS course will be offered in the winter term (E111, Effective Communication Strategies for Engineers and Scientists). Students taking the course will explore scientific storytelling through the following communication genres: research manuscripts, abstracts, and proposals; figures, slide decks, and oral presentations; and traditional and social media channels. To learn more, visit E111. The 22-foot-deep basement of the Kármán Laboratory, which originally contained two-story water tunnels, has been redesigned to meet the needs of the Space Solar Power Project (SSPP). The project was conceived by Professors Harry Atwater, Ali Hajimiri, and Sergio Pellegrino and is aimed at developing the scientific and technological innovations necessary to enable a space-based solar power system consisting of high-efficiency photovoltaics, an integrated power conversion system, and a phased-array system to distribute power dynamically, all mounted on ultralight deployable space structures. The new space was designed by CO Architects for the research team developing the deployable space structures. The two-story height of the space allows the team to assemble the various components created in the cleanroom and wet chemistry laboratory. Movable tables, light fixtures, and retractable electrical cord reels enable the space to be easily reconfigured for the construction of large test pieces. The structures integration area is organized around a sequence of activities transitioning from dirty to clean, and it contains the first three-wavelength laser cutter installed on the West Coast of the United States. 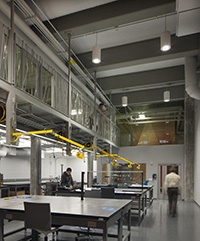 The existing service mezzanine was repurposed to house new offices for graduate students that are accessed from a catwalk overlooking the integration area. 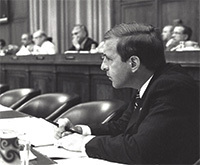 During the spring term, Ed Zschau, a former congressman who represented Silicon Valley in the 1980s, offered the Caltech course E102: Scientific & Technology Entrepreneurship for 26 Caltech students. This course was designed to introduce students to the analyses and actions required to launch a successful high-tech company. Specifically, it provided approaches for evaluating new technologies and business ideas for commercial feasibility, determining how best to implement those ideas, attracting the resources needed to start a new venture, selecting appropriate business models, refining products and plans based on prospective customer interactions, structuring and negotiating important business relationships, attracting customers or users, and managing early-stage companies toward “launch velocity.” Professor Zschau brought to the course his 20 years of experience in heading startup companies (and a major IBM division in the 1990s) as well as his 20 years of offering similar courses at the Harvard Business School and in the engineering schools at Princeton University and the University of Nevada, Reno. Thirty-five years ago, three Caltech professors joined forces to co-teach a new course called Physics of Computation, which aimed to identify and explore the fundamental laws of computation. Richard Feynman wanted to know, “Is it possible to build computers that use the laws of quantum mechanics to compute?” while Carver Mead was curious about “What’s the ‘right’ way to implement computation in silicon?” and “Can we learn anything useful from biology?” John Hopfield posed the questions, “How does the brain compute? How does it remember? How does it learn from experience?” Their innovative approach gave rise to a vibrant community of scholars and a new field called Computation and Neural Systems (CNS). The Caltech PhD program in CNS began in 1986 and continues to challenge students to understand the brain on a computational basis and to draw inspiration from biology to design autonomous intelligent machines. 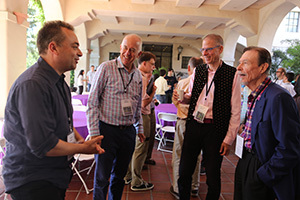 Faculty, alumni, and friends of the CNS program came to Caltech in August 2017 to celebrate their 30-year history and consider the future. Professor Pietro Perona proposed that the CNS community’s main future challenge is to investigate the interconnections between the scientific fields of brain and behavior and the engineering fields related to intelligent autonomous machines. To learn more about ththe CNS degree program, visit cns.caltech.edu.